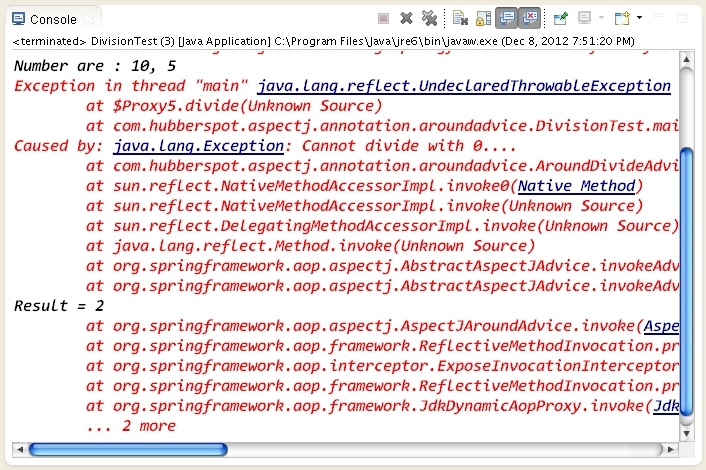 How to implement Around Advice using @AspectJ Annotation-Driven AOP in Java ?. A simple application to demonstrate how to implement Around Advice using @AspectJ Annotation-Driven AOP in Java. // implemented by providing @Around annotation. // will execute around divide method of Division interface. // helps in invoking the divide method. // be called or not. // and than validate it accordingly. // It also has a proceed() which transfers controls to method being advised.